Linda was there, but when everyone surrounded Paul she said, “I’m getting out of here!” and went straight inside. Our friend, Phil L. (who we met the night before) managed to get an autograph and was quite happy with himself. Later on, we met the rest of our friends, who had just arrived from the States that morning: Barb, Mary Ann, George and Mar. Now our next “Mission Impossible” was getting tickets inside. Doylene and Susie had gotten Barb and Mary Ann their tickets from Sue at MPL, but our ticket money and letters had mysteriously disappeared from the Royal Court Theatre. This was to be our first unfortunate encounter with a weird little man who happened to be box office manager for a few days (the theatre was closed down and Paul was trying to save it so he performed there instead of the Empire, which is a bigger hall). This man claimed that he never got our letter and/or money and it would be impossible to get us in. Meanwhile, there was a photographer there and he decided that the American girls would make a “nice story” so the box office manager decided to get in on the act. Doylene, Susie and I were photographed for the Daily Mirror and we had to go upstairs to the office where they had Doylene and Susie make these ridiculous poses with the manager. He still insisted that he wouldn’t’ be able to help us as Doylene and Susie held the tickets and he pretended that he was giving them to them! After this ridiculously embarrassing publicity stunt, we were literally being down the door outside when we saw Tony Brainsby (Paul’s long time publicity agent) and he told me that Lawrence Jubar was going to give us tickets and to go downstairs and pose for a photograph with him! So, we all went downstairs and me Lawrence, who is very nice and so sweet. The photograph never did get in the papers, but the photographer later told us that he was trying to sell the story to a magazine. A small article was printed about Doylene and Susie though. So, with many thanks to Lawrence, we had good tickets into the show. This was a terrible day for Doylene, Susie and I. The box office manager gave everyone standing tickets except for the three of us. He pocketed their money, charging them full price to stand in the balcony! He warned them not to move from where he told them to stand and kept coming back every few minutes to check up on them. Guilty that some usher may want to check the tickets he never gave them! He looked at the three of us outside and had absolutely no compassion whatsoever. I can’t even begin to explain the horrible feeling in the pits of our stomachs when someone opened a door and we heard Paul singing “Let it Be” while we were outside. We saw Paul arrive at the stage door, but the scene there was nearly riotous and Paul was rushed inside. Tonight, our “pal” at the box office manager, decided he liked the taste of American money and charge each of us $12.00 to get in and let us stay in the balcony. While we were waiting to be seated (or standed?) we were instructed to wait in a private bar. Denny came in and was signing autographs for everyone. He signed a magazine we had purchased with Wings on the cover for each of us. Doylene had him sign the page he was on; Susie had him sign the cover. He decided to sign Susie’s right on Paul’s face! All I could think of was “I paid 45p ($1.00) for that magazine and I can’t afford to go buy it again” so when it came to my turn and I saw his pen heading towards Paul’s face, I scolded him and said, “Not on his face!” “Oh! Is it okay if I sign on his hand?” “Yeh.” We all stood in the balcony together and had a fantastic time! As I said before, we were still close, even though we were in the balcony, and our telephoto lenses helped a lot too. We were all making comments, singing along and having fun clicking away with our cameras. Pau was really having a good time too and it was the best audience (Paul said so too). This was one of my favorite shows and a good memory. The next day was a “day off” but we had heard a rumor that Paul was going to give a special concert on the Royal Iris (a ferry), so we decided it was worth checking into although we doubted that it was true. Still we could take a few photographs of the Mersey. We went down to the Peirhead around 2:30 and a man selling newspapers said, “Do you know that Paul McCartney is going on the Royal Iris at 3:00?” He explained that it was a press conference. Barb and Mary Ann were already there (after having been told about the press conference by Alan Williams’ associate, who they had had lunch with earlier). The Royal Iris is the same ferry that the Beatles posed on in 1963. The ferry was covered with Wings posters and all the bodyguards were there dressed in tuxedos, so we knew that the press conference was a reality. The docks were packed with photographers and locals who wanted to see Paul, as well as people simply waiting to take a ferry across the river. 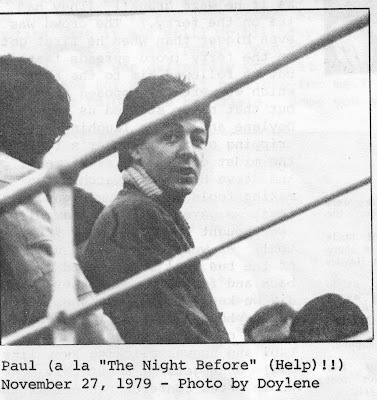 It was so exciting, and made me feel so nostalgic to see Paul on the docks, all the press, people buzzing with excited chatter and anticipation—just like the old days. The bus pulled up onto a nearby dock, and they all walked to the Royal Iris while all the photographers snapped away and got in our way. The bodyguards were really annoying and kept pushing us, but somehow Doylene and I managed to get away from all that, and we were able to watch without too much of a hassle. What got to us was that after getting in our way, the photographers were allowed n to the ferry for a regular photo session. Still, I was happy to be so lucky to even be there to begin with! Nothing could make me feel down at that moment. 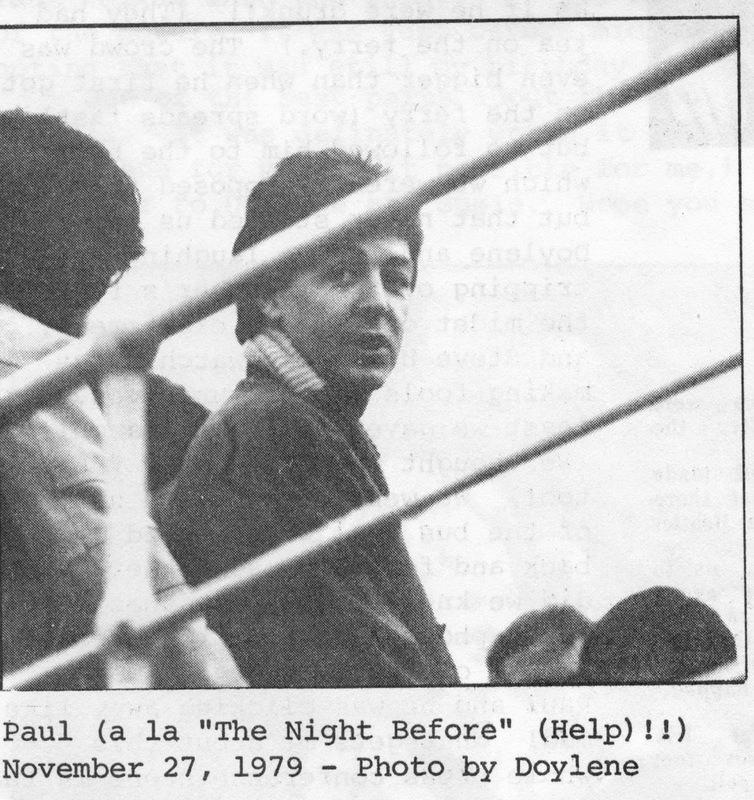 A few minutes later, while the ferry was still in dock, I heard a girl yelling, “Paul! Look down here!” And suddenly realized that the whole band was on the top deck for a photo session. 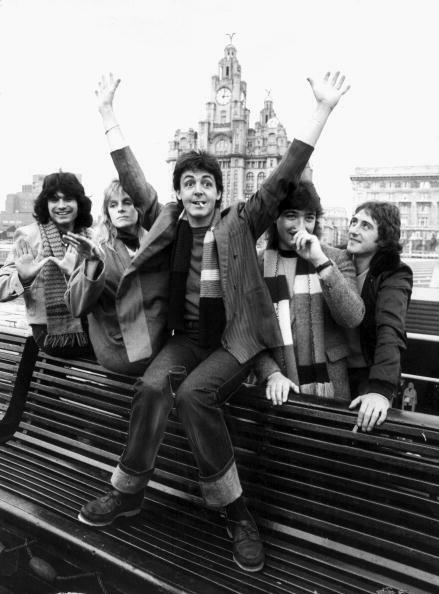 They returned about a half hour later and as Paul was leaving the ferry he began singing “Mull of Kintyre” as if he were drunk! (They had been drinking tea on the ferry). The crowd was even bigger than when he first got on the ferry but we followed him to the bus which we weren’t supposed to do, but that never stopped us before. Doylene and I were laughing and tripping over each other’s feet in the midst of all the excitement and Steve Holly was watching us making fools out of ourselves. At least we gave him a good laugh! We went over to the side of the bus Paul was on, and waved back and forth at each other. 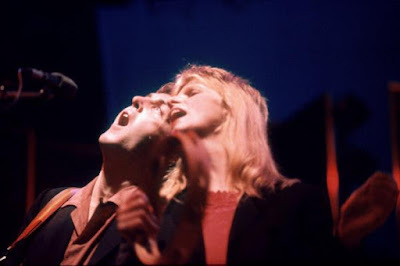 Little did we know at the time that there was a photographer getting a real charge out of watching us watch Paul and he was click away like mad! What gets me about this whole press conference scene is that of all the photographs taken, we only got to see a few. Who knows where the rest are? For this, we were trampled on so the press could get their photos. Photos that were never even printed. But, it was a wonderful experience, especially when we didn’t expect it to happen. A definite highlight of the tour! That night we watched two Wings specials on TV and the news showed a little bit of the press conference. Hope that America will be able to show these specials. They were great. Gear. 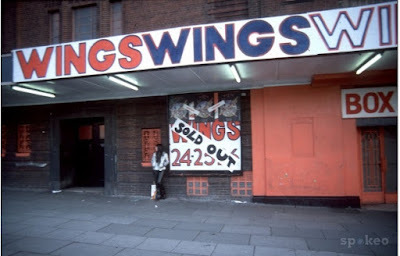 So this would be 19 years after he was winding cables for Massey & Coggins and nipping over the fence when JL insisted the job came second to a Cavern lunchtime gig. 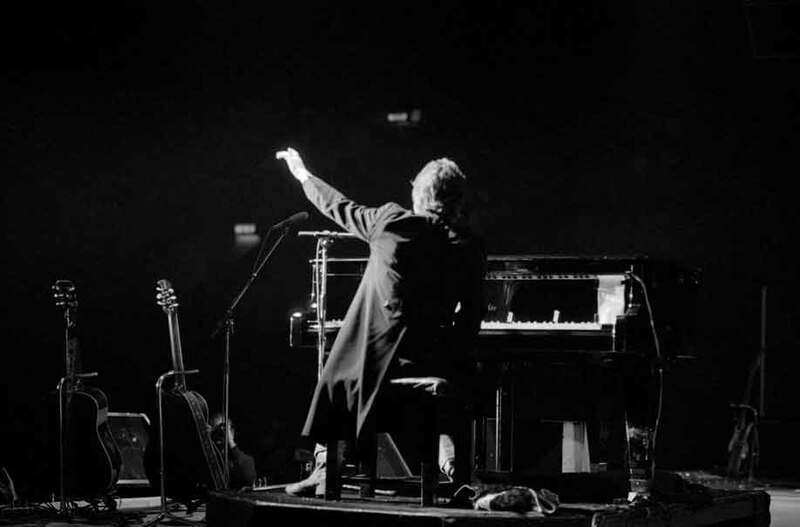 And "the theatre was closed down and Paul was trying to save it so he performed there instead of the Empire, which is a bigger hall" is yet another example of PM's dedication to his roots.